There is absolutely no respite from the hot sultry weather that we are experiencing since the past two weeks. Looking forward for some light showers with cool weather. Meanwhile, I have been relishing some refreshing desserts using ripe mango before the mango season ends. One of the easy desserts that I made was mango kulfi recipe. Ever since I have posted the kulfi recipe, I have received requests for recipe of mango kulfi. I made it slightly different from the authentic style kulfi which calls for boiling the milk over slow flame for a long duration of time. I decided on a short cut method and followed an easy mango kulfi recipe with condensed milk and fresh mango pulp. 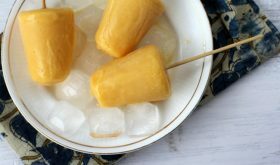 An absolutely no cook mango kulfi recipe with minimal ingredients that you can prepare in less than 15 mts. 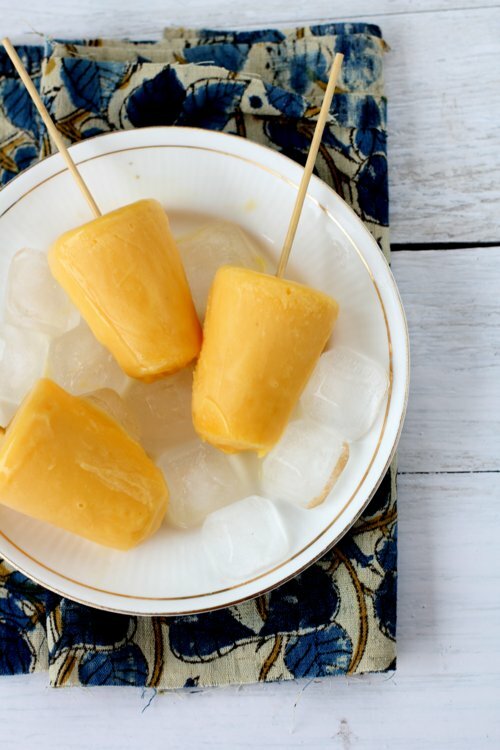 You can put your ripe mangoes to full use by making a batch of mango kulfi to beat the heat. Inspite of going the quick or instant way, the result is amazingly good using condensed milk and cream. It has a rich and creamy texture with an unbeatable flavor. Utterly delicious Indian style ice cream that makes for a fantastic dessert to beat the heat. Place chilled cream in a bowl and beat for 4 mts. Place in fridge till use. In a bowl, add condensed milk, mango puree and cardamom powder and beat for 2 mts till well combined. Add the beaten chilled cream and mix well till combined. Fold in the nuts and pour the mixture into kulfi molds till 3/4th full. Seal the molds and freeze for at least 5-6 hours. At the time of serving, place molds under tap water for a few seconds so that it releases easily from the mold. Insert sticks into each kulfi and serve. You can add 1/2 cup of reduced milk or evaporated milk to the above mixture at Step 2 and mix. You can use popsicle molds or earthen pots/matkas to set the mango kulfi. You can use whipping cream if you do not have fresh cream on hand. Remember to chill fresh cream before beating it. 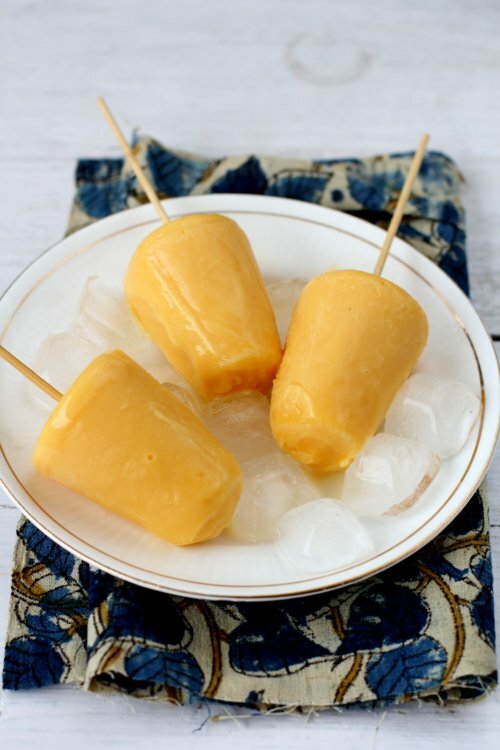 By Sailu Published: July 7, 2015 Mango kulfi recipe is a popular Indian ice cream. 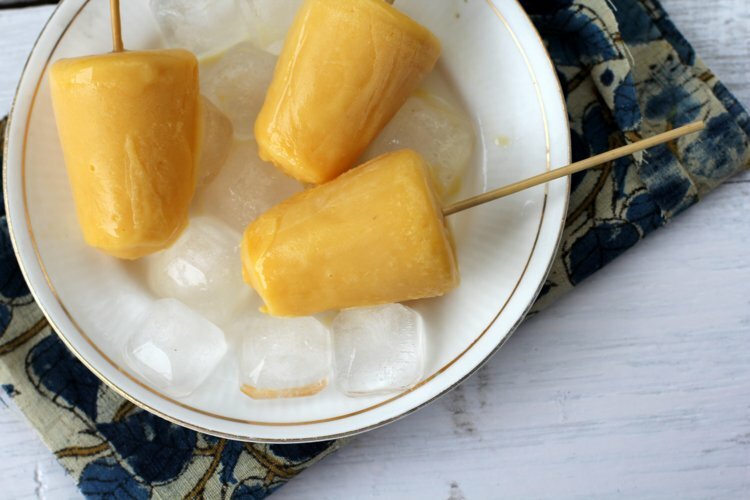 Learn how to make mango kulfi with condensed milk, mango pulp. Best Indian dessert that's instant & easy.